Okay. Real talk. I never liked cheesecake very much as a non-vegan. I don’t love the idea of my desserts tasting like cheese. Unless it is like a cheese plate. Or a subtle tiramisu. Okay, I take that back. Cheese in desserts is fine. Maybe I just had one too many badly defrosted mushy embarrassments that I was pushed to reject it all. But, I decided to give it another chance as a treat for a cheesecake fan in my life. This vegan take is inspired by this recipe from 84th & 3rd. I would highly recommend using virgin coconut oil. I used refined in this cake and the middle turned out a little bland. A kick of coconut may be just what it needed. Sift all of the dry ingredients together. Add the coconut oil for the crust and mash through with a fork until mixture resembles bread crumbs. Like you are making a pie crust. Add almond milk one tablespoon at a time, stirring until the dough holds together when pressed with your fingers. Line the inside of a spring form pan with parchment paper. Pour the chocolate crust in to the pan. Spread evenly and press flat on to the base. Bake for 12-15 minutes. Remove the crust from the oven and let it cool completely while you make the cheesecake filling. Blend half of the soaked cashews with the lemon juice, coconut oil and dates until very smooth. Add the rest of the cashews, vanilla, salt and almond milk and blend again until very, very smooth. Once it was all combined, I separated the batch in two and blended them in a food processor separately to make sure it was extra smooth. Spoon the filling in to the pan with the cooled pie crust and smooth out the top as best you can. Put it in the fridge to firm up for at least 2 hours. While it cools, you can make the raspberry topping. Blend raspberries in a food processor until smooth. Push the berries through a fine mesh sieve and in to a medium saucepan to remove the seeds. Whisk the raspberries, sugar and cornstarch over medium heat and cook until thickened. About 5 minutes. Remove from heat and let it cool. 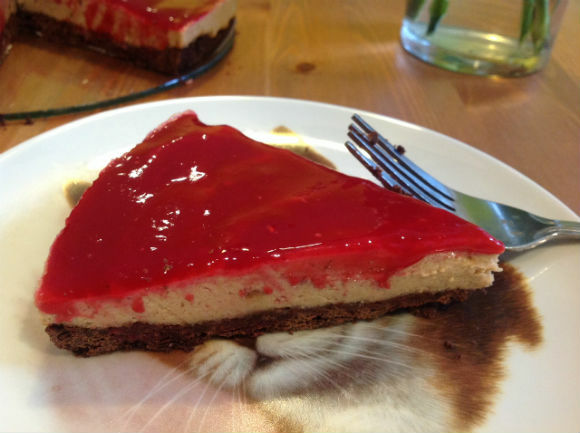 Once the cheesecake has set, spread the raspberry puree gently and evenly over the top. Return the cake to the fridge or release the cake from the spring pan and serve.